For you coffee lovers out there, this will definately excite you! Not much of a coffee fan myself, just the occassional arabic coffee, I hate coffee and it smell, which most people adore, gives me migranes. I sound like an old person. Anyways, I was flipping through Martha Stewart's Living magazine when I saw this absolutely must have gadget. It made me wish I loved espresso. 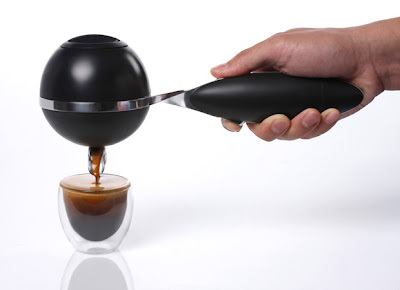 It's called Mypressi Twist Portable Espresso Maker. No electricity needed. You just need boiling water, ground espresso, and a gas cartridge. This is perfect for people who hate their office coffee, plus IT IS portable, could be easily carried with no hassle. If you plan on getting one, go to mypressi. Its just $169 (48KD). Makes a good gift for a coffee lover.